A dramatic reading of the science fiction novella by author and critic Samuel R. Delany. Adapted for radio by the author, who also acts as narrator, it is a poetic and nightmarish vision of the future, with a conjectural view of the changes in social mores brought by an extra-solar expansion of humanity. The complex electronic score was especially written by Susan Schweers. The other voices belong to Randa Haines, Walter Harris, Jerry Matz, Joan Tanner, and Phoebe Wray. Technical production by David Rapkin and Ed Woodard. Production assistance by Neal Conan. Directed by Daniel Landau. The story first appeared in Worlds of Tomorrow magazine, published by Galaxy Publishing Corp. 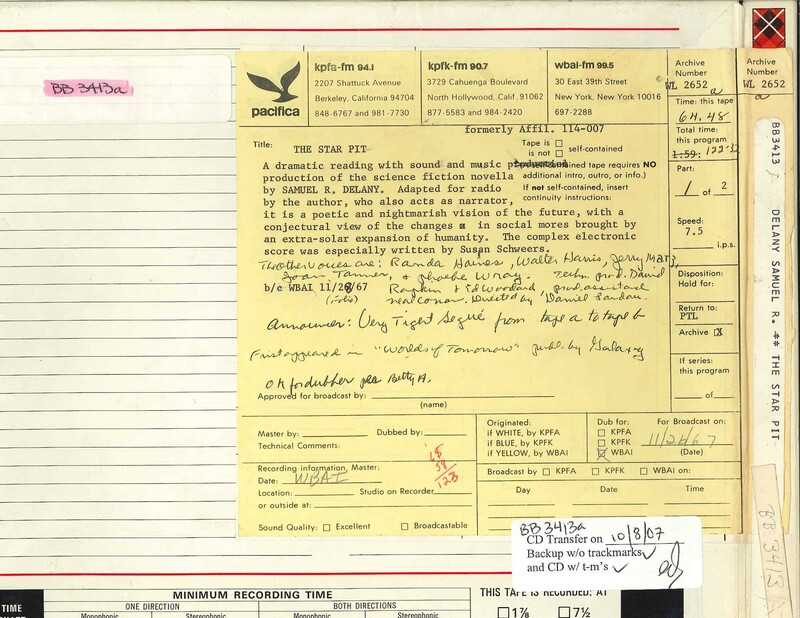 This recording was formerly cataloged as BB3413A. Current catalog data suggests that this show first aired on WBAI 1967-11-26. The tape box suggests that the broadcast was pushed to 1967-11-28. Neither date in the WBAI November 1967 folio contain any mention of either of these dates. The first time this show is introduced in the WBAI folio is in the January 1968 issue. It should be assumed that the first broadcast of this program on WBAI was 1968-01-28. Box note: Archive Number WL 2652a.